Temecula represents Southern California's wine country. Kick off your visit on the 20th (Mon): wander the streets of Old Town Temecula and then admire nature's wide array of creatures at San Diego Zoo Safari Park. Get ready for a full day of sightseeing on the next day: stop by Old Town Spice & Tea Merchants and then get in on the family fun at LEGOLAND California. To find reviews, other places to visit, and tourist information, use the Temecula holiday planner . San Diego to Temecula is an approximately 1-hour car ride. You can also take a bus. Traveling from San Diego in May, expect slightly colder with lows of 53°F in Temecula. Finish your sightseeing early on the 21st (Tue) so you can travel to Spirit Lake. Spirit Lake is a city in Dickinson County, Iowa, United States. Kick off your visit on the 22nd (Wed): look for gifts at Goodies Handmade Candies and then get in on the family fun at Arnolds Park Amusement Park. For ratings, photos, more things to do, and tourist information, you can read our Spirit Lake trip itinerary planning site . Explore your travel options from Temecula to Spirit Lake with the Route module. Due to the time zone difference, you'll lose 2 hours traveling from Temecula to Spirit Lake. Prepare for slightly colder weather when traveling from Temecula in May: high temperatures in Spirit Lake hover around 67°F and lows are around 47°F. Wrap up your sightseeing on the 22nd (Wed) to allow time to travel to Crater Lake National Park. Kick off your visit on the 23rd (Thu): explore the striking landscape of Crater Lake National Park. To see other places to visit, traveler tips, ratings, and other tourist information, refer to the Crater Lake National Park online day trip planner . The Route module can help you plan travel from Spirit Lake to Crater Lake National Park. The time zone difference moving from Central Standard Time (CST) to Pacific Standard Time (PST) is minus 2 hours. When traveling from Spirit Lake in May, plan for a bit warmer days and about the same nights in Crater Lake National Park: temperatures range from 77°F by day to 49°F at night. Finish your sightseeing early on the 23rd (Thu) so you can travel to Tulelake. Tulelake is a city in Northeastern Siskiyou County, California, United States, at an elevation of 4066ft above sea level. For traveler tips, more things to do, and more tourist information, read Tulelake day trip planning tool . Drive from Crater Lake National Park to Tulelake in 2 hours. Traveling from Crater Lake National Park in May, things will get a bit cooler in Tulelake: highs are around 68°F and lows about 37°F. On the 23rd (Thu), you'll travel to Yosemite National Park. 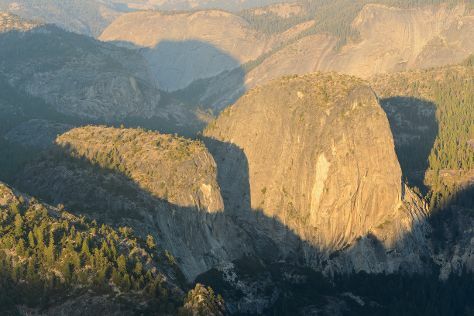 Kick off your visit on the 24th (Fri): take in the dramatic scenery at Yosemite Falls, make a trip to Yosemite Conservation Heritage Center, then admire the sheer force of Vernal Fall, then take in the views from Pohono Bridge, and finally take in the dramatic natural features at Glacier Point. To see photos, maps, traveler tips, and tourist information, read our Yosemite National Park itinerary maker site . Use the Route module to find suitable travel options from Tulelake to Yosemite National Park. In May, plan for daily highs up to 65°F, and evening lows to 34°F. Finish up your sightseeing early on the 24th (Fri) so you can travel to South Lake Tahoe. Start off your visit on the 25th (Sat): kick back and relax at Pope Beach and then contemplate the waterfront views at Emerald Bay State Park. To see more things to do, photos, traveler tips, and tourist information, use the South Lake Tahoe day trip planning website . Traveling by bus from Yosemite National Park to South Lake Tahoe takes 6.5 hours. Expect a daytime high around 63°F in May, and nighttime lows around 35°F. Finish your sightseeing early on the 25th (Sat) so you can travel back home.